What is the Anti-Imperialist Front? What are the objectives it pursues and what political and ideological basis it has? Who can form part of the Anti-Imperialist Front? The Anti-imperialist Front was created after a Symposium Against Imperialist Aggression Against People in 2014. It is an anti-imperialist unity (alliance) of 15 organisations and individuals. It is an international alliance. The goal is it to build a unity and front of struggle of all oppressed people in the world against aggression and all interests of all imperialist and fascist forces. The Anti-imperialist Front is a union, which is covering every institution agaist imperialism and imperialist aggression. The actual situation in the world is very complicates, especially for the oppressed countries and people, and it also represents a clutter of interests which is hard to understand and analyze. How and what kind of analysis does the Anti-Imperialist Front make about the actual situation in the world? If we are looking at the current situation in the world on the basis of class struggle it is actually not confusing. One of the most important analysis of the Anti-Imperialist Front is, that even when the imperialist have a clash of interests from time to time, they always get to an agreement when it comes to oppress the people. Starting from this analyses we can see, that the main contradiction in the world is between imperialism and oppressed people. The contradiction between imperialism and oppressed people will be complemented with the support of the imperialist collaborators in the oppressed countries. In the present the revolutionary and the anti-imperialist movement in the world is very scattered and divided. A question which generates a lot of divisions and debates about the existence of a single imperialist block headed by USA or there are two blocks: one headed by USA and the other one by Russia and China. What is the position of the Anti-Imperialist Front about this question? There are two imperialists blocks: one is headed by the USA and its collaborators, the other with all its internal contradictions is headed by the EU. Russia and China are categorised as capitalist countries and acting in their own regional interests. But we cannot say, that these two countries are differentimperialist blocks. Because if we analyze them in the growth of the capitalism they are not powerful enough to be imperialist. Independently of how are Russia and China categorized, what is clear is that they are emerging capitalist countries driven exclusively by their geopolitical and economic interests and that their help to the oppressed people of Syria, Venezuela, etc. is always conditioned by those interests. 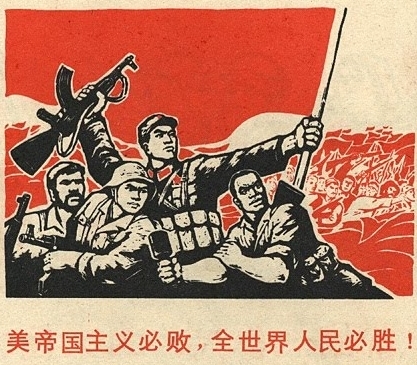 What is the position of the Anti-Imperialist Front regarding Russia and China? Currently, one part of the world left defends Russia and China as anti-imperialist and that those countries should lead the world anti-imperialist movement. What is the position of the Anti-Imperialist Front about this question? The anti-imperialist struggle can only be driven by the united fight of the oppressed people. Russia and China are developping economical and political relations in the frame of their regional interests. It is not possible to think, that the Anti-Imperialist Front and anti-imperialist struggle can be leaded by these two countries. On the base of the anti-imperialist struggle are the oppressed people. Only because a country is confronting with Imperialism to save their own interests or has contradictions with them from time to time, doesn`t make them necessarily a part of the anti-imperialist struggle. In the case of resisting against imperialist aggression, could be supported from the oppressed in different forms. But this solidarity can only be in the frame of the right of self-determination and of the people and resisting against imperialist aggression. The current war in the Middle East is of special importance: Syria, Palestine and Kurdish people on the side of the oppressed and USA, Israel, Turkey, feudal arab monarchies on the side of the oppressors. What is the position of the Anti-Imperialist Front on the Middle East? Middle East is a region, where man made divisions and contradictions by Imperialist countries exist for decades. People where divided and made enemies of each other. The main contradiction at this region is between the oppressed people and Imperialism. On the axis of US Imperialism are local collaborating governments and on the other side resisting people. The freedom of the people in Middle East only is possible, when Imperialism and their collaborators can be removed, based on the united struggle of the people. It will be suggested, that the main enemy is IS to legitimate the collaboration with Imperialism. But to make an alliance with Imperialism against IS won´t bring freedom for the people of Middle East. Only a united fight of the people against Imperialits and their collaborators, who where supporting and feeding IS, can lead to victory. How should the revolutionary and anti-imperialist world movement confront the imperialism and the wars of aggression against the oppressed countries and people? What is Anti-Imperialist proposing in order to organize the resistance and the struggle against imperialism in the world? What is the importance that Anti-Imperialist gives to the unity of revolutionary and anti-imperialist movement in the world? What are the basic principles of this unity? The answer of an anti-imperialist world movement is without any doubt to support the resistance of the oppressed people. To organize that struggle should be on the basis of strengthening the unity and the quality of the union. Even if the support will be gradual. The solidarity we are talking about should be based on beginning the struggle on our own countries, as well as spreading out to the people worldwide and additionally to support it actively. The growth of the struggle depends on breadth of the struggle in the countries of the members of the organization. Apart from the expansion the struggle world wide, the main principle of the unity is: to turn towards the people and repel the imperialist aggression in a common struggle. To take a concrete statement against imperialism. Because imperialism is confusing the people with their own agenda. So friend and foe will be mixed up. So it is indespinsable to be clear in terms of imperialism. So one of the basic principles of the unity should turn against imperialism and all kind of collaborators and prevent that people make enemy of each other.